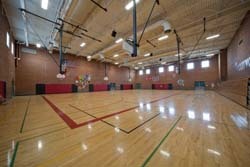 (Phoenix, Arizona) - Greenway Middle School has a proud history dating back to 1912. What began as a one room schoolhouse in northeast Phoenix has evolved into a district serving 33,000+ students in grades K-12. Originally named Sunnyside School, it was the first within what is now known as the Paradise Valley School District. The middle school is recognized as one of the top educational institutions in the nation, and serves as a model for other secondary schools across North America. Located on the corner of 30th Street and Greenway Road, the school is home to approximately 580 seventh and eighth grade students. The campus features a highly flexible gymnasium, a weight room, a tennis court, a running track, a full-sized field, and contemporary Science labs. The ultra-modern facilities provide students with a comfortable atmosphere and an extraordinary learning environment. Like many other schools in its district, Greenway faced a number of energy challenges in 2008. In dealing with both rising energy costs, and increased budget constraints, the school also had an inefficient energy management system. Personnel struggled with inconsistent cooling and poor ventilation, inadequate and insufficient lighting, as well as the lack of centralized control. Determined to find a way to reduce energy consumption and costs, as well as improve serviceability to schools throughout the district, officials established an energy management program. The program was designed specifically to analyze current system’s performance and identify where improvements need to be made. As an outcome of the program Greenway Middle School was directed $1.1 million for a mechanical systems overhaul. As part of the overhaul facility personnel requested for lighting upgrades and a custom tailored, web-based energy management & control system. 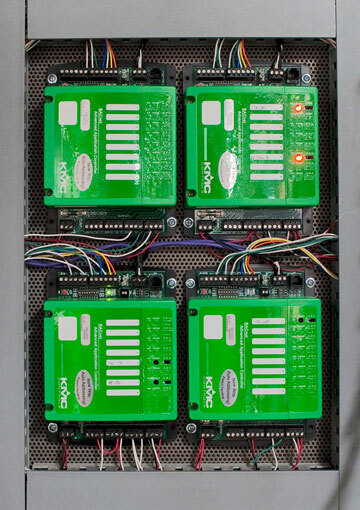 In search of a solution that was in touch with their needs, school officials turned to Urban Energy Solutions, a KMC Controls® Authorized Partner to design and implement a system that would meet the districts aggressive energy reduction goals. “We chose to partner with Urban Energy Solutions because of their high level of expertise and unrivaled customer service,” commented Daniel Rinker, EMS/ HVAC Technician for the northeast Phoenix district. Work began in June of 2009 and by August the school had two new water-cooled chillers, two new gas boilers, new fan coil units, and upgraded air handlers with demand and occupancy-based control ventilation. In addition, new high-efficiency lighting with occupancy-based controls and power monitoring equipment was installed. All of these control systems and equipment were integrated and managed with KMC Controls BACnet Advanced Application Controllers. The controllers provided an open interoperable system that seamlessly communicates with the Niagara AX JACE front end. Since the installation district officials have been extremely impressed with the performance and results the digital system provides. 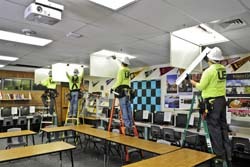 “After comparing Greenway’s monthly energy use in December of 2009 to the same period in 2008, energy consumption was down nearly 50 percent,” noted Joe LaRovere, Energy Management Division Manager at Urban Energy Solutions, Inc. “This reduction in energy consumption is vital to the district schools. Faced with a one-two punch of decreased funding and rising utility costs, they simply cannot survive long term without an energy management program in place,” he added. Because of the reduction in power demand, Greenway has received the ENERGY STAR® award as well as over a $100,000 donation from Arizona Power Service. Through the efforts of Urban Energy Solutions and the rest of the project team, Greenway will continue to serve as the benchmark to other school systems across the nation.